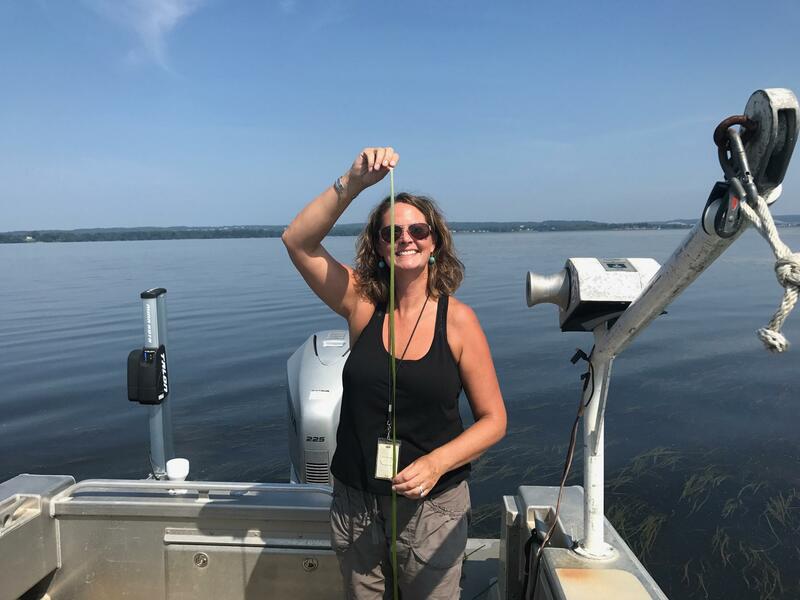 Maryland Department of Natural Resources biologist Brooke Landry holding a strand of wild celery in the northern Chesapeake Bay. Maryland has experienced the rainiest year on record in more than a century, with the 43 inches falling through August 15th -- the most since 1889. So much stormwater has been flooding down the Susquehanna River into the northern end of the Chesapeake Bay that the Exelon Power company opened several of the flood gates on the Conowingo Dam, unleashing a torrent of sediment and pollution that had been trapped behind the dam. In the past, large rainstorms have proved devastating for the bay’s underwater grasses – which are home to blue crabs and fish and perhaps the single best indicator of the Chesapeake’s health. After Hurricane Irene and then Tropical Storm Lee hit in 2011, for example, grasses in the bay were smothered by sediment, plummeting by 44 percent over two years. That was before they then rebounded and more than doubled to more than 100,000 acres last year, the largest extent since monitoring began in the 1980s. To get a sense of how the bay’s grasses are holding up to the historic rainfall this year, I set out in a boat from Havre De Grace on the northern Bay with Brooke Landry, a Maryland Department of Natural Resources biologist and aquatic vegetation expert with Chesapeake Bay Program. It was a sunny morning, with a little bit of haze and gulls circling overhead. The waters looked murky, brownish green. Landry slowed the boat and explained that we would soon be exploring the Susquehanna Flats, a shallow section that – historically, at least – have been home to the bay’s healthiest forests of submerged aquatic vegetation or SAV’s. Because the water was so muddy, I was expecting the worst – perhaps nothing but dead water and a raft of floating garbage from the most recent storm. But then, remarkably, about a half mile out, the brown waters became a more transparent blue. We suddenly saw a large, swaying mass of lush grasses, thick with fish. Landry explained that the grasses have grown so well-established and dense the last few years, they are now filtering and clearing up the water around them on their own – creating the conditions for their own photosynthesis. While this summer’s rains likely diminished the bay’s grasses somewhat, Landry said, EPA pollution limits that took effect in 2011 – at about the same time as the last destructive storms – appear to have strengthened and encouraged the grass beds enough that they are now becoming hardy and more resilient to storms. Scientists will know better when aerial surveys of the bay’s grass beds are finished later this summer. But they could show a spot of sunshine in an otherwise rainy day.